Scientists have detected high levels of a toxin produced by freshwater algae in mussels from San Francisco Bay. Although shellfish harvested from California's coastal waters are monitored for toxins produced by marine algae, they are not routinely tested for this freshwater toxin, called microcystin. The toxin, which causes liver damage, is produced by a type of cyanobacteria (also known as blue-green algae) that thrives in warm, nutrient-rich water conditions. It has been found in many lakes and rivers in California, including the Sacramento and San Joaquin Rivers, which flow into the San Francisco Bay Delta, and in several Bay Area lakes. Raphael Kudela, the Lynn Professor of Ocean Health at UC Santa Cruz, said his lab investigated the potential for microcystin to contaminate shellfish after detecting low levels of the toxin in water samples from San Francisco Bay. The researchers tested mussels collected from five sites in the Bay. They also did experiments with both mussels and oysters in tanks to determine how quickly the shellfish take up the toxin and how long it takes to clear it from their tissues. The results are published in the journal Harmful Algae. "We found that this freshwater toxin accumulates in shellfish, both mussels and oysters, and that in San Francisco Bay, the toxin levels in some mussels exceed the recommended guidelines for consumption by quite a bit," Kudela said. The researchers also detected low levels of the toxin in commercial oysters from Tomales Bay, although the levels were well below the guidelines for microcystin levels in fish. 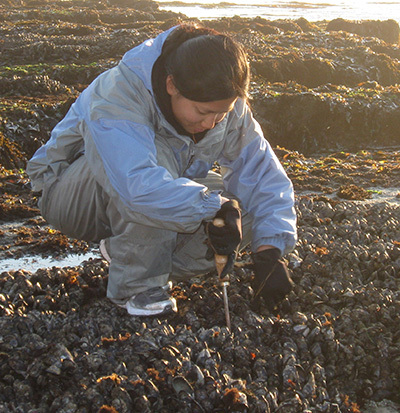 First author Corinne Gibble, who worked on the study as a UCSC graduate student and is now an environmental scientist with the California Department of Fish and Wildlife, said the findings suggest tests for microcystin should be added to existing shellfish monitoring programs. "There is monitoring of shellfish for marine-derived toxins, but because this is a freshwater toxin no one has been looking for it. Now it seems microcystin is something we should be monitoring as well," Gibble said. A state quarantine on harvesting of mussels for human consumption is usually in effect from May through October to prevent poisonings from marine toxins. Kudela said his lab has been working closely with state agencies, and they are continuing to conduct tests to determine the extent of the microcystin problem and the best way to address it. "The agencies have been very responsive," he said. "There is potential for this toxin to affect humans, but most of our samples are still below the recommended limits for human consumption, so people shouldn't panic and think they can't eat shellfish." A greater concern, he said, is the potential impact on marine mammals such as sea otters, which eat large amounts of shellfish. In 2010, Kudela and scientists with the California Department of Fish and Wildlife reported that microcystin poisoning had killed several sea otters in Monterey Bay. "This really highlights the connectivity between what people do on land and what happens in the ocean," Kudela said. "A lot of shellfish farms are downstream from freshwater sources, so we want to raise awareness of this issue." Blooms of the cyanobacteria that produce microcystin are a growing problem throughout the United States and around the world due to warming temperatures and nutrient pollution. Microcystin from algal blooms in Lake Erie, for example, contaminated the water supply for Toledo, Ohio, in 2014. In the Bay Area, it has forced closures of public swimming areas at Lake Anza in Berkeley and Lake Temescal in Oakland. Kudela said he suspects the toxins detected in San Francisco Bay are coming from multiple sources, including the rivers that flow into the Delta as well as local sources. The drought appears to have exacerbated the problem throughout California, he said. "The rains help by flushing things out. Warm, dry conditions favor these blooms, so we've been seeing more of them lately than we would without the drought," Kudela said.